We have written before on The Trunki Files about the joys – and perils – of city breaks with young children. They can offer new and surprising experiences, and are far less reliant on the weather than your usual bucket-and-spade destinations. They can, however, also become overwhelming and exhausting if not planned in the right way. On a recent trip to Barcelona, I made time to visit the nearby resort of Sitges. Just 30 minutes by train from central Barcelona, it struck me what a great place this would be to stay if you wanted to give city breaking a go. First and foremost, Sitges has lovely beaches, which are a great fall-back for any child weary of being walked around museums and zoos. Fine, golden sand has been crafted by sea defences into nice bays that harbour shallow waters, great for paddling toddlers. Behind the beach, running the length of the bay, is a wonderful, traffic-free promenade, buggy-friendly with a play park and a couple of places to buy ice creams along the way. The town centre is also largely pedestrianised and full of shops and restaurants (I stopped at a bakery called ‘Enriched’ that served sensational patisserie that would make most kids’ eyes pop). The train trip itself into Barcelona (at the bargain price of 4 Euros each way) is an adventure for children and once there, you are deposited right at the heart of things, at the Passeig de Gracia. You have the Ramblas in one direction and Gaudi’s landmark buildings in the other; or you can just change onto the metro and head off. Furthermore, you have no need for a car to get to Sitges from the airport; simply get the train to El Prat de Llobregat and change there. There are a couple of watch-outs for prospective city-breakers. 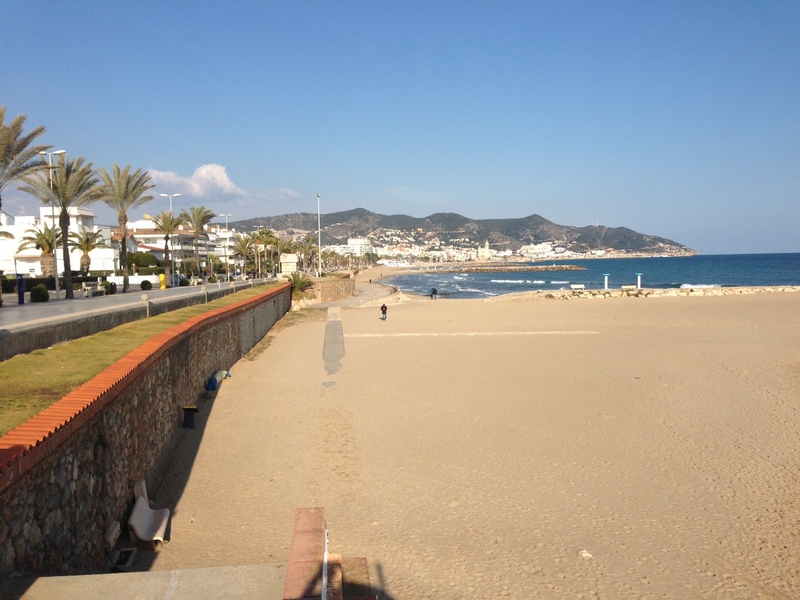 My experience of Sitges was mid-week in February. Beaches were deserted and everywhere was (blissfully) quiet. In the summer, particularly on weekends, Barcelonans come in their droves to enjoy Sitges’ delights, and things apparently get a bit noisy in the resort centre. Consider staying on the fringes in the residential areas to avoid late nights. Also, if you do go in summer, you might also want to familiarise yourself with the beach ‘scene’; particular sections are popular with gay men and nudists, whilst others are where families congregate. Make sure you choose the one that’s right for you! So there you have it: a city break with a beach – a potentially winning combination. In a few weeks time I am headed to the beach resort of Cascais for the weekend. Similar to Sitges, it is just 30 mins from Lisbon city centre and offers a similar set-up. Look out for the Trunki Files’ verdict. Where to go at Easter? This entry was posted in Destination guides, Europe and tagged Barcelona with kids, city breaks with kids, Sitges with kids. Bookmark the permalink. 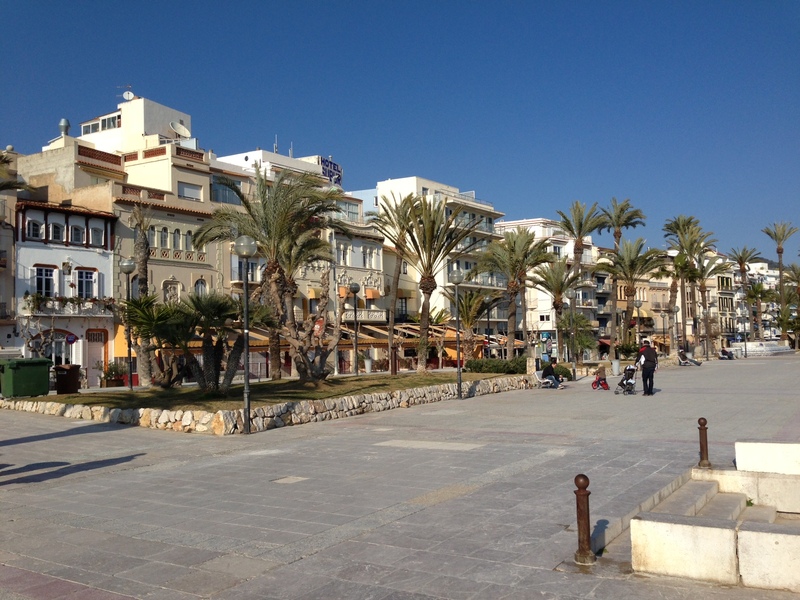 Agree – Sitges is a fab family friendly place. Used to live a bit further down the coast in Vilanova and also Tarragona (also both great places with easy access to Barcelona). Also worthwhile checking out when the ‘fiestas’ are on if you’re planning on going. They are great fun but some may be a bit full on for families or if you’re after a quiet break. Thank you for posting this! I was getting worried (after searching online and Google maps) that there were no playgrounds anywhere in Sitges! We are going to be there in a couple of weeks and we’re are looking forward to taking our 3 year old and 1.5 year old to explore new territory. Do you have a favorite site you go to for all the festivals and celebrations of the summer? Also did you find special family friendly restaurants that should not be missed? Thanks! 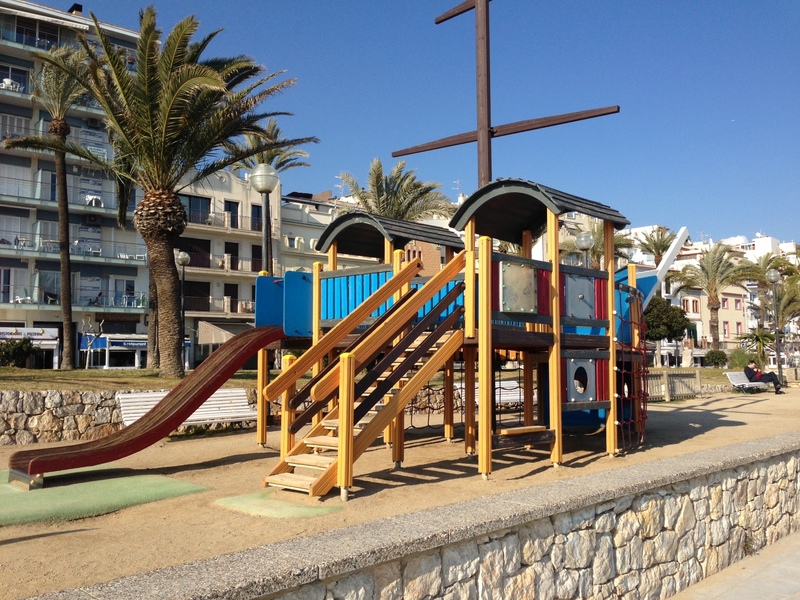 The playground is definitely there, right on the front by the beach, the kids will love it. I have only been to Sitges once so don’t know about any sites, sorry. Likewise, no particular special restaurants for kids – in general, all Spanish restaurants are pretty welcoming and accommodate them without fuss. Do go to the bakery I mention in the post though, kids will love choosing between the eye-popping patisseries.